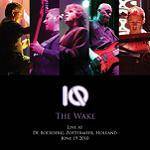 More information: Live recording from the ‘25th anniversary tour’ of The Wake. This show was recorded at The Boerderij in Zoetermeer, one of the highlights of the tour. A CD and DVD package, the DVD also includes the encores from the show.